Only the first show in the official Milan schedule, but it feels like getting straight down to business. After London, no 1970s reference should surprise us but Marani does not hold back. 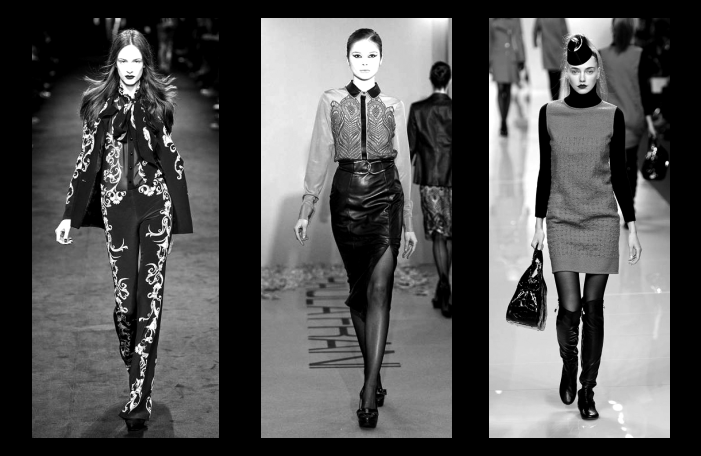 We’re seeing lady chic, western, party animal and working girl, all ready to sweep anyone off their feet. For head-to-toe prints and clashes, you’ve got florals, grapevine, check, jacquard, leopard, cheetah, python, and the odd stripe. 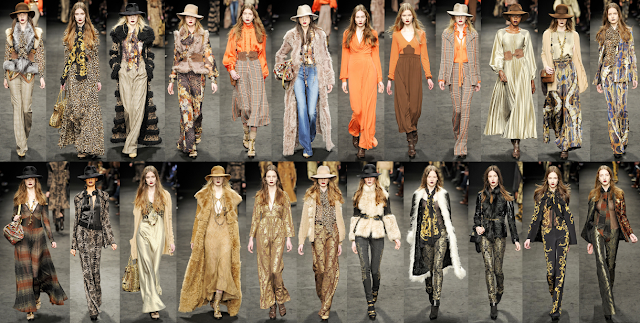 Colours are autumn forest brights (orange, brown, taupe, black and gold, with flashes of red and blue) in chiffon, metallic threads, tweed, shearling, fur and leather. As for the cuts and shapes... in a single word, Dallas - all jazzed up, for day and night. Drawing inspiration from a variety of eras from the 1920s to the 1980s and the Antiquity, Paola Frani shows us the many faces of the perfect Italian seductress. In her arsenal of weapons we find the tailored trouser suit, the pencil skirt, the classic pintuck pleat skirt, blouses and shirts, flowy tea dresses and goddess dresses. A few signature prints (spot, pebble and feather) are almost always present, subtly supporting, never overpowering the cuts and shapes. Besides monochrome contrasts, we see coral and quite a few creamy pastels, white, lilac, duck egg and camel, just to name a few. But the real key to Frani’s approach is in the detailing. She uses transparency, embellishment, feathery accessories and layers, ruffles, waist ties and pussybows, contrasting sleeves and collars, toughened up by platform sandals, loafers and courts, achieving just the right balance. One of the largest catwalk collections of the whole season without a doubt, dreamt around the glory of Italy, past and future. 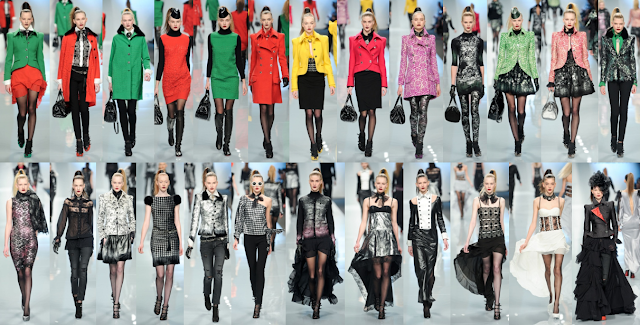 The show that kicked off with the Italian national anthem spanned style elements from dressy baroque and military, through 20th century pieces (1960s cuts and colour blocking galore), to a futuristic take on heritage checks and prints in silver metallics. Other trends Rocco explores have their roots in the 1980s with bodycon elements, deconstruction and asymmetry, and underwear as outerwear built on transparency, lace inserts and ruffles, elevated to eveningwear status by opulent neck candy. I’ve always remembered Roccobarocco as a cool, hedonistic, high impact, creative brand. Well, this collection not only ticks all those boxes, but also proves that the seasoned designer finds it easy to remain true to his chosen name after all these decades.